The perfect choice in a Java Brown Fabric discount church chair. 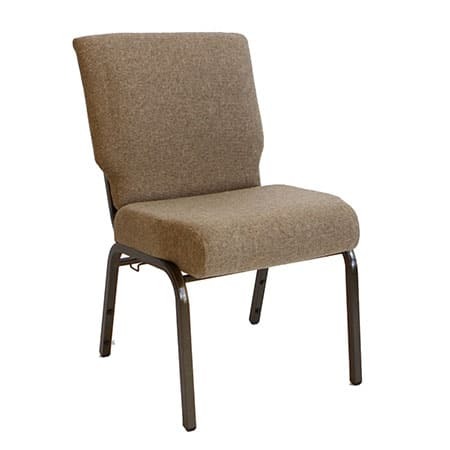 A&M Church and School Furniture offers a very attractive economy church chair that features durable, long wearing Java Brown Fabric with Black frame finish. These economy church chairs offer a 21 inch plushly padded seat with a waterfall front for added church seating comfort. The seats and backs on these padded church chairs are securely attached using T-NUT fasteners, which are much stronger than wood screws. This church chair includes a sewn on card pocket and welded bookrack with communion cup holder. The EC- Java Economy 21 Inch Church Chair offers a 21 inch plushly padded seat with a waterfall front for added church seating comfort. The seats and backs on these padded church chairs are securely attached using T-NUT fasteners, which are much stronger than wood screws. This church chair includes a sewn on card pocket and welded bookrack with communion cup holder.